Austrian physician and author; born at Prossnitz, Moravia, Jan. 12, 1797; died there May 14, 1873. Brecher, who was the first Jew of Prossnitz to study for the medical or any other profession, attained the degree of master of surgery and obstetrics in Budapest in 1824, and the doctor's degree from the University of Erlangen in 1849, with the thesis "Das Transcendentale, Magie und Magische Heilarten im Talmud," Vienna, 1850. His fame in Jewish literature rests principally on this work and upon his lucid commentary on the "Cuzari" of Judah ha-Levi, which appeared with the text in four parts (Prague, 1838-1840). Brecher's correspondence with S. D. Luzzatto about this commentary is published in part in the second volume of the work itself, and in part in Mendel Stern's "Kokebe Yiẓḥaḳ" (v. 28-34, vi. 95-100, vii. 77-80). The commentary is modern in its tone; and in the preface the author openly states that he attempts to explain metaphysical questions in the light of modern philosophy, and he is not afraid to criticize axioms or formulas which were accepted at the time of the author of the "Cuzari," but were shaken or rejected by later researches. He also utters the opinion, bold for his time, that philosophy is the best check to religion, preventing it from degenerating into superstition and idolatry. 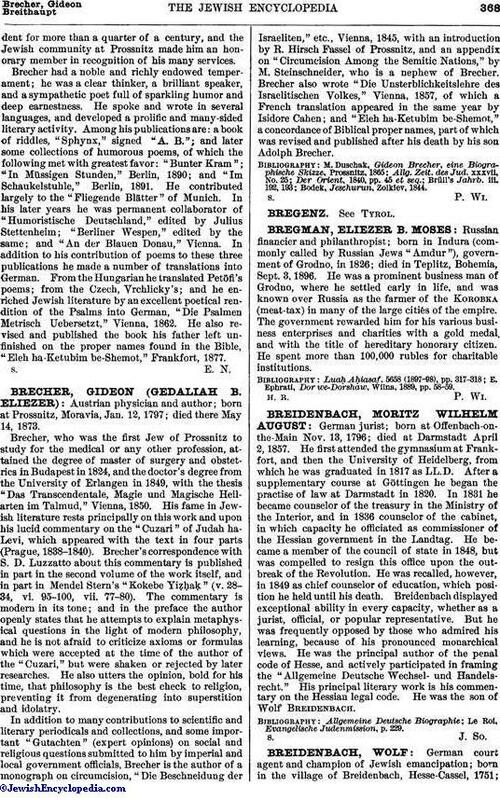 In addition to many contributions to scientific and literary periodicals and collections, and some important "Gutachten" (expert opinions) on social and religious questions submitted to him by imperial and local government officials, Brecher is the author of a monograph on circumcision, "Die Beschneidung der Israeliten," etc., Vienna, 1845, with an introduction by R. Hirsch Fassel of Prossnitz, and an appendix on "Circumcision Among the Semitic Nations," by M. Steinschneider, who is a nephew of Brecher. Brecher also wrote "Die Unsterblichkeitslehre des Israelitischen Volkes," Vienna, 1857, of which a French translation appeared in the same year by Isidore Cahen; and "Eleh ha-Ketubim be-Shemot," a concordance of Biblical proper names, part of which was revised and published after his death by his son Adolph Brecher.